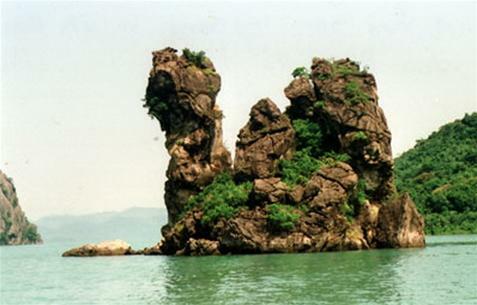 It is located within Bai Tu Long bay, which with Ha Long Bay forms an impressive scenery of sea and islands. Including thousands of islands and rocks, they create one of the most beautiful bays in the world. Now the Park is part of Van Don district. The exactly geographical position is in a rectangle between 20o55'05" and 21o15'10" North latitude, 107o30'10" and 107o46'20" East longitude. It administratively consists of 3 communes : Minh Châu, Vạn Yên and Hạ Long of Van Don district. It is composed from a terrestrial area of 61.25 km2 and an aquatic area of 96.58 km2. The zone includes over 40 islands and rocks. They form three groups : Ba Mùn group, Trà Ngọ group and Sậu group. The aquatic area includes the sea zone between the islands and the narrows between the park area and the land area which has boundary of 1 km offshore. The National Park also includes a buffer zone of approximately 165.34 km2 , which is located in a larger area including 5 communes : Minh Châu, Vạn Yên, Bản Sen, Quan Lạn and Hạ Long. The total population of the core zone and the buffer zone is around 24.000. 06am A bus will take you at the appointment or your place, departure to Quan Lan island. To Van Don, we will stop for lunch, then take a boat to Quan Lan, check in there then free to the sea. Dinner are served at hotel and overnight there. After having breakfast, visitors can walk around the island without guide. Lunch will be served at restaurant. Afternoon is time for visit Bai Tu Long by cruiser, visit the biggest Song fish feeding area in Vietnam. To Van Don, your hotel is in Bai Tu Long resort, free swimming. Dinner and overnight at the hotel. Breakfast, you are free to visit and swimming at the resort. - Bus (having air conditioner) follow the program. - Cruiser to visit bay. - Hotel with 2 star standard. - Tickets, travel insurance, tour guide. - Telephone, drinks, launchdry ... and other personal cost. * Children under 05 ages are free of charge (must pay for travel insurance). * Children from 05 to 10 ages are charged of 50% price for adult, sleep with parent's bed. * Adult are counted for person from 11 ages. * Above price may be changed at each time.